Back in 2012 we visited Japan and of course took in some paper-making establishments. On the way back through Tokyo I bought a small stock of plain hand-made paper and small quantities of five different hand-blocked pattern papers. I've been sitting on them (in a manner of speaking) waiting to find a short but suitable text. I finally found one. Lafcadio Hearn was born in Greece in 1850 to a British father and Greek mother. At the age of two he was taken to Ireland and, having been practically abandoned by his family, at the age of 19 he was sent to Cincinnati where he was thrown onto his own efforts to make a living, which he did writing by for newspapers and magazines. In 1890 he found himself in Japan with a commission for a newspaper but was again abandoned. This time he took work as a teacher, finally becoming a professor of English literature at the Tokyo Imperial University. He married a Japanese and became a naturalised Japanese himself. He died in 1904. In 1898 his Exotics and Retrospectives was published. In it he plays the role of tour guide, opening up the world of Japan to us. I have chosen part of his description of his ascent of Mount Fuji. Its opening words almost have the flavour of a haiku: 'From strings stretched above the balcony upon which my inn-room opens, hundreds of towels are hung like flags'. 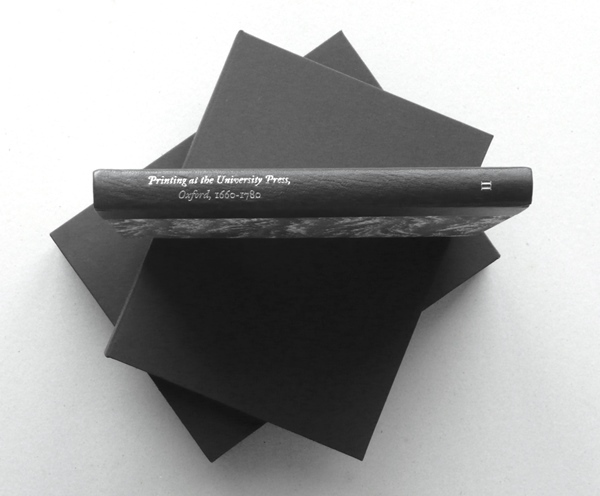 The text and title page have been printed in hand-set 14pt Octavian on five sheets of kozo paper, folded on the fore-edge and sewn into wrappers. Just forty printed. There are five different cover papers. Copies are £30 each plus p&p at cost. Press Subscribers will receive their copy with the usual 15% discount. If you would like a copy just let us know. If you tell us your preferences for cover, we'll try to satisfy them according to which covers remain available. So '2 3 4 1 5' means you would like the blue blobs cover, and failing that the red blobs cover, and failing that . . . '. Copies have now been sent out to meet pre-publication orders. You can find full details at our website. Meanwhile here is some detail on the two editions: standard and de luxe. Secondly, what does it look like? In the de luxe edition, the book is quarter bound in brown leather (as volume I) with a paper marbled by Jemma Lewis on the boards (the colour way is as volume I but the marbling style this time is nonpareil). 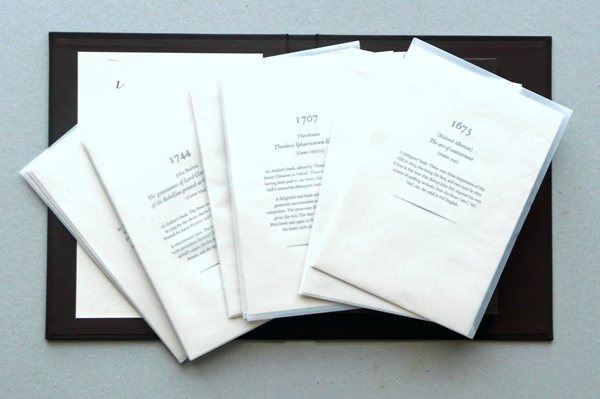 The book and portfolio are then housed in a slip-case. Leather and cloth are in the same colour as for volume I. To illustrate the changes that occurred in the types used over the period it seemed most appropriate to use leaves from the actual books. Over the past few years I have watched online for copies that were advertised as, for example, 'front and back boards missing and title page defaced' or 'severe water damage to fifty pages' - copies that I felt it acceptable to break so that they could serve one final purpose! A leaf or, in some cases, leaves for a particular book are preserved in a translucent envelope which itself comes in a paper wrapper giving details of the book and any pertinent notes about the types used. All being well, we shall be publishing the third and final part of this trilogy later this year - the main volume is all ready for digital printing and the text of the extra volume that will form part of the de luxe edition has gone for typesetting in metal. 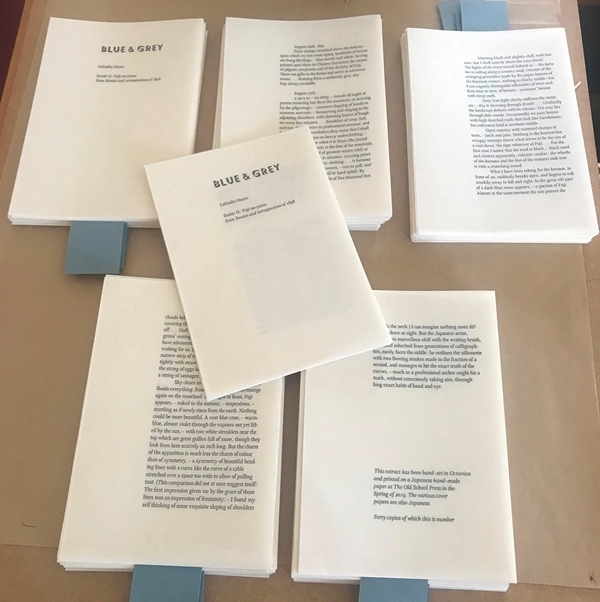 I shall be printing the latter letterpress on a hand-made paper that was amongst the reams that I bought from the defunct monastery print-shop at St Hugh's Charterhouse. Unfortunately it doesn't carry a watermark but certainly much of the other papers I bought were from Rives, Van Gelder, and English mills, so I think it will make a fine addition to the de luxe copies. That extra volume is entitled Learning about Printing. 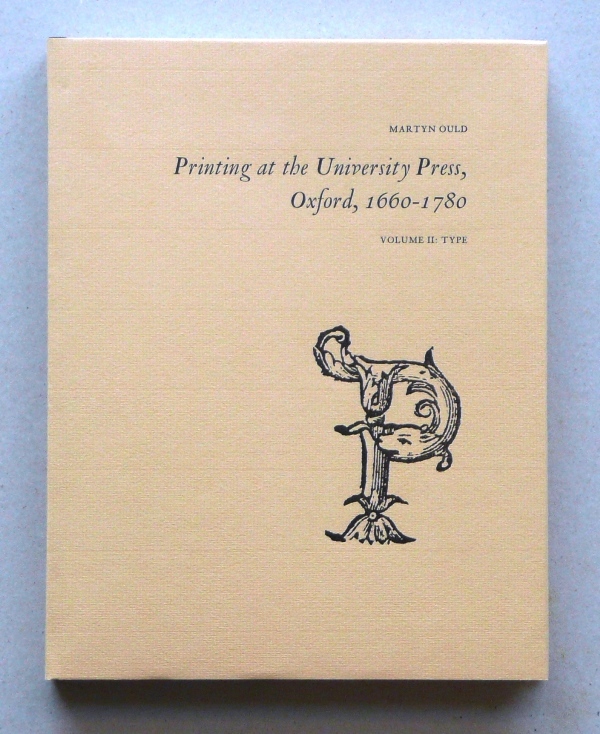 When Bishop John Fell and his three partners took over the University Press in the early 1670s they knew little of the economics or practicalities of printing books and had a steep learning curve to climb. They were helped with advice by their foreman, John Hall, and we are fortunate to find in the Bodleian Library manuscripts by Fell, one of his partners Thomas Yate, and John Hall, in which they explore those commercial and practical lessons. Although they no doubt initially saw themselves as would-be entrepreneurs, in the event they proved no match for the London Stationers who could undercut them and spoil their hopes of financing the publication of short-run learned texts through the bulk sale of text-books to the Stationers. Via the fourteen manuscripts I trace that journey.